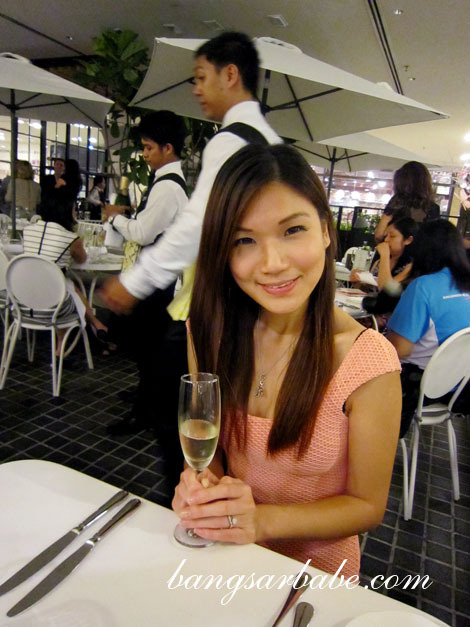 Champagne and soirees are treats a girl enjoys every now and then. I’ve always considered champagne a grownup’s drink. 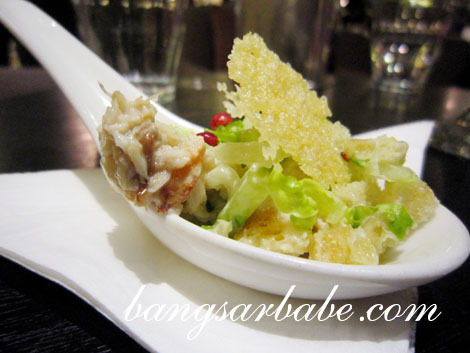 Plus you get to dress up and eat pretty food like the recent soiree I attended which featured Duval-Leroy champagne at Bistro 42 in Bangsar Village. The Duval-Leroy Brut Rosé was a lovely pre-dinner drink. Fine bubbles with nuances of floral notes, this was not only pretty to look at, but a delight to sip. 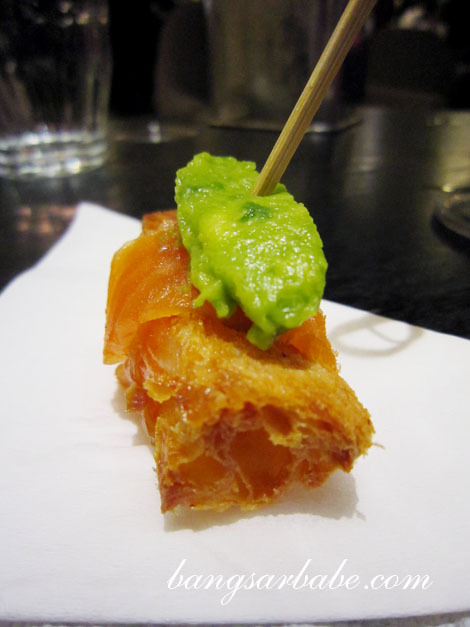 So I sipped and sipped with an assortment of canapés from Bistro 42. Dinner started with a pretty Spring Salad – seasonal vegetables and chopped nuts with ranch sauce and garnished with dainty edible flowers. I liked the texture of the chopped nuts as they gave the composition more crunch and character. The ranch sauce dressing was alright, but nothing memorable for me. 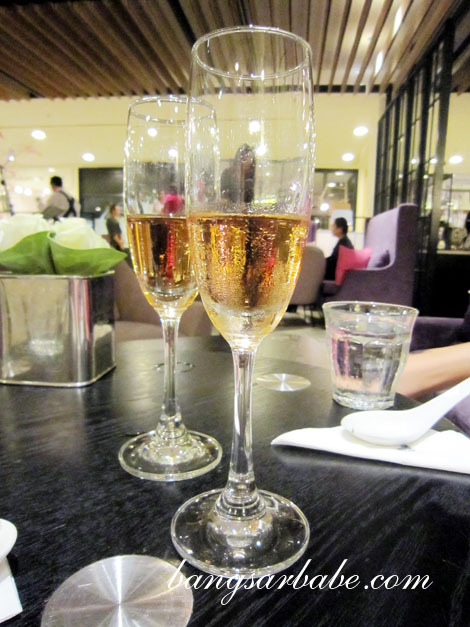 The champagne paired with the diner menu was the Duval-Leroy Brut – a perfect balance of finesse and power. Unlike the rose which was delicate in nature, the brut had more bubbles with a full body and assertive finish. 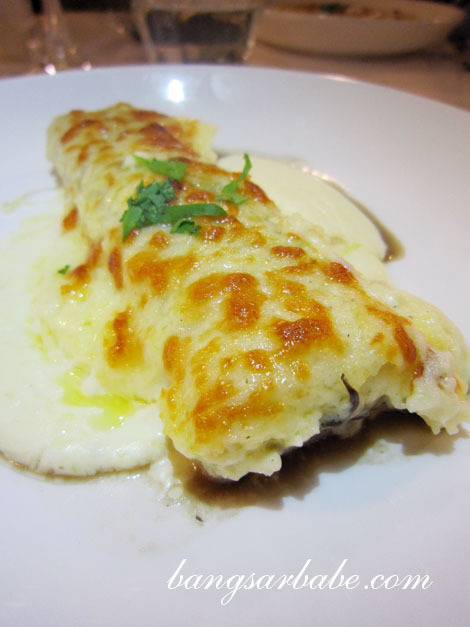 The entrée of Cannelloni filled with a trio of mushrooms and rich cream sauce was as rich as any dish made with meat. I liked how the mushrooms were cooked till tender and the béchamel-like sauce gave the cannelloni a rich flavour. Good stuff. 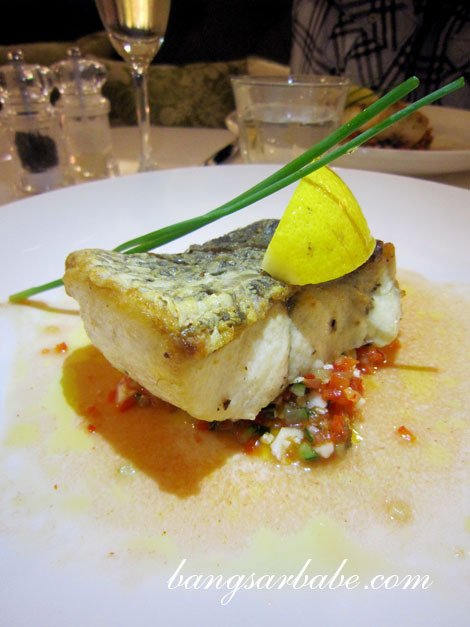 Alas, the Crispy Fillet of Barramundi was slightly overdone. Portion was generous and the skin was well-executed, but the fish was cooked until there was little or no moisture at the centre. The consolation for this was the bed spicy vegetable salsa – tangy, sweet and just slightly spicy, this paired well with fish. 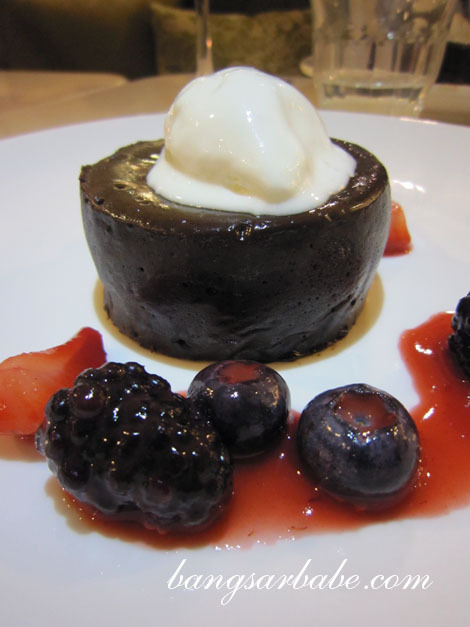 Dessert was the chocolate fondant, my favourite that night. 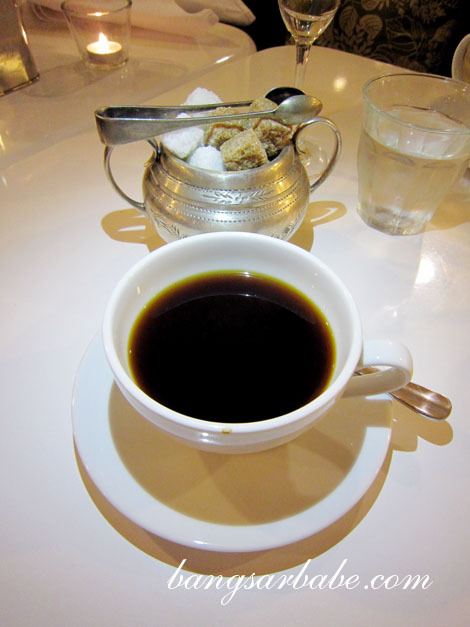 The fondant had a crusty exterior which gave way to a river of dark and dense molten centre. I liked the tart accent from the berry compote as it helped offset the richness of the otherwise very rich dessert. After dinner, I managed to squeeze in a chat with Carol Duval-Leroy, the woman behind this champagne business. Duval-Leroy is a merger of two Champagne growers and was established in 1859 in Vertus and Carol took charge of the company in 1991. She is the force behind the modernization of production processes, the development of traditional distribution channels and the increased product range and expanded exports of the company. An amazing accomplishment, don’t you think? 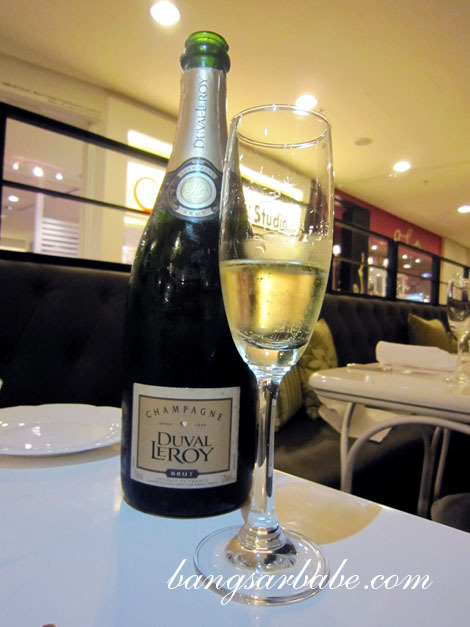 If you want a sip of Duval-Leroy champagne, it is available at Bistro 42. I also spotted the bottle on sale at Ben’s Independent Grocer in Publika. Thanks Carole from Salina & Associates, for the kind invitation! Yup, it’s denser than what I’m accustomed to. how is the taste? Good? 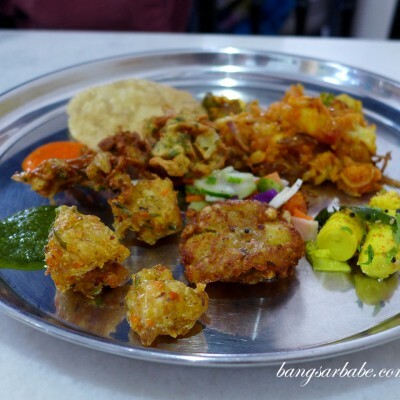 Price for the dinner menu? I’m not sure how much dinner was, as it was a champagne event. Will check and get back to you. 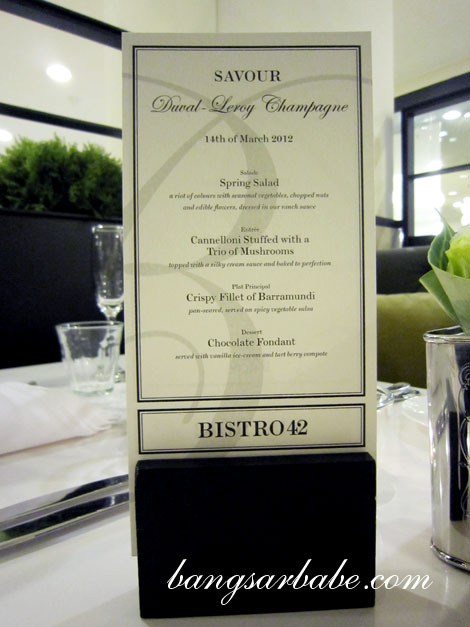 The set menu for Duval champagne was specially designed for the event to pair with the champagne served. 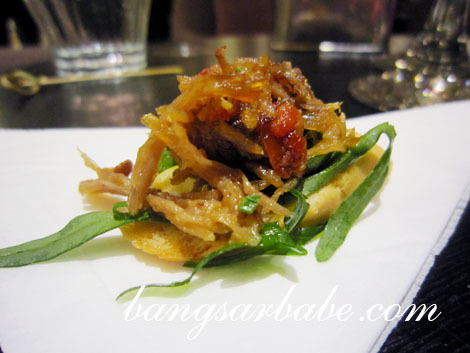 If you want to request for it, Bistro 42 can prepare the same set menu. But you will need to call them to ask about the pricing. 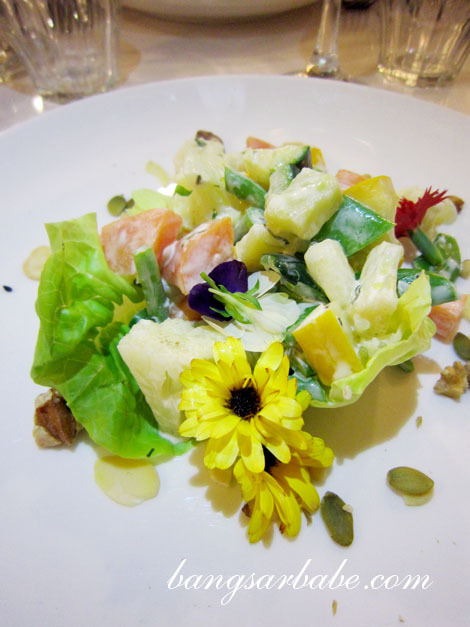 The spring salad is very pretty to look at – love the use of edible flowers.